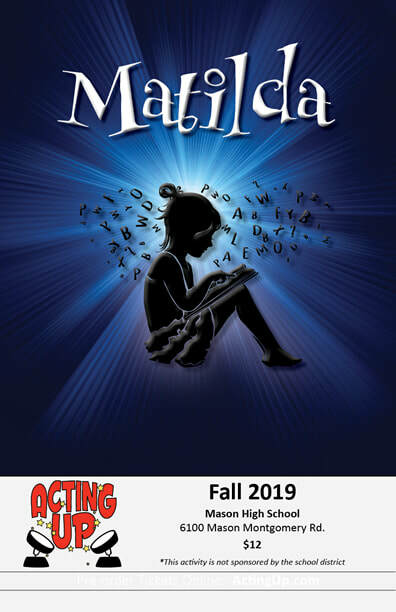 Auditions for our Fall 2019 musical, Matilda, are scheduled for May 6 and 7, with callbacks on May 9. ​Auditions will be limited to actors 8 to 18 yrs old (and still in high school). ​To secure an opportunity to audition, you must sign up for a date/time via SignUpGenius. Additional audition details are provided on the SignUpGenius page. Performance dates are anticipated to be Sept. 20-22, subject to final confirmation on Mason High School theatre availability. Please check back for a short dance-demo video to give you the opportunity to practice the audition dance steps prior to your audition. MATILDA WORMWOOD. Female; Mezzo-Soprano; an imaginative girl who is clever and wise far beyond her years. She has a thirst for learning that cannot be quenched. (We will be considering actors within the 8-18 age range for this role, that can play a young girl). MR. HARRY WORMWOOD. Male; Baritone; Matilda's uncaring father; a slimy, greedy used-car salesman. MRS. Zinnia WORMWOOD. Female; Mezzo-Suprano; Matilda's self-absorbed, negligent mother and an amateur ballroom dancer. MICHAEL WORMWOOD. Male; Tenor; Matilda's older brother; he is not very bright and favored by their parents. MISS AGATHA TRUNCHBULL. Male/Female; Baritone; the tyrannical headmistress at Matilda's school who despises children. MISS JENNIFER HONEY. Female; Mezzo-Soprano; Matilda's kindhearted teacher; she is tired of living in fear under Miss Trunchbull. MRS. PHELPS. Female; spoken; local librarian who encourages Matilda's love of reading. SERGEI. Male; Baritone; Russian mobster; Russian dialect. HENCHMAN/WOMAN 1. Male/Female; Tenor; Russian dialect. HENCHMAN/WOMAN 2. Male/Female; Tenor; Russian dialect. HENCHMAN/WOMAN 3. Male/Female; Mezzo-Soprano; Russian dialect. RUDOLPHO. Male; Tenor; mechanic-employee of Mr. Wormwood and Mrs. Wormwood's ballroom dance partner/instructor; affected Italian dialect. BRUCE/BREE BOGTROTTER. Male/Female; Matilda's classmate; he/she is subjected to extreme punishment by Miss Trunchbull. LAVENDER. Female; Matilda's classmate and friend. AMANDA THRIPP. Female; Matilda's classmate and friend. NIGEL/NANCY. Male/Female; Matilda's classmate and friend. ERIC/ERICA. Male/Female; Matilda's classmate and friend. ALICE. Female; Matilda's classmate and friend. HORTENSIA. Female; Matilda's classmate and friend. TOMMY/TINA. Male/Female; Matilda's classmate and friend. ENSEMBLE - ADDITIONAL CLASSMATES. Male and Female. ENSEMBLE - ADDITIONAL PARENTS. Male and Female. The following is general information for a "typical" Acting Up audition. However, certain productions may differ in some respects from the below general information - so be sure to double check the requirements posted at the link to Sign-Up Genius associated with the audition. Depending upon what the production storyline calls for, we typically look to cast actors/singers/dancers ages 10-18 years old. You do not need to live in Mason, Ohio, to audition. Audition Form. A completed audition form found on the Acting Up Cast Management System Database. Resume. If your previous experience doesn't fit on the audition form, please also provide a resume (click for an example resume). Do not be discouraged if you don't have that much experience. In the past, we have cast all ranges of prior experience in principal roles as well as ensemble. Recent Photo. This does not need to be a fancy headshot. A selfie taken just before auditions will do. We just use these to keep all of our auditioners straight. Wear something comfortable that you can dance in. If you are new to theater / auditions, you may have a lot more questions than are answered on this page. Please also check our Frequently Asked Questions for Auditions page if you still have questions regarding auditions. Where Can I Get More Information on Auditions? May I Audition Via Video? You will be out of town or have some other extenuating circumstance preventing you from attending in person for all open audition dates. You have obtained prior permission from the Producer and Director to audition via video. Your video submission must be received by noon on the last day of open auditions and include links to song, monologue, and dance videos. Your Audition Form with conflicts (from the database) and a headshot must also be emailed or received via USPS by the last day of open auditions. If all of the above audition requirements are not fully adhered to within the required timing, your video audition will not be considered for casting. The last day of auditions is considered to be the last day of open auditions, not callbacks. Are you interested in being part of the Stage/Technical Crew? If you are interested in being part of the Stage and/or Technical Crew, and are between the ages of 12 and 112, please e-mail us at ActingUp@ActingUp.com, and use the subject header: "Stage Ninja". If you would like to be added to our emailing list, please click here. If you don't find an answer to your audition-related question after carefully reviewing this page as well as our Frequently Asked Questions for Auditions page, please do not hesitate to contact us at ActingUp@ActingUp.com​ or (513) 494-6062.